— Share my outlook on how the power may shift again. Are we embarking on a new future where app developers will have to trust AI to do the right thing? As a PM at large publisher in ’07 I saw the Rise of Open Mobile when we were getting more visitors from WAP browsers than telco portals. By February ’08 I was in the Valley and noticed that the Valley got publicly into the game in April ’08 — Mike Arrington had written about Sam Altman’s Loopt as the “future of social networking”. My post on VentureBeat a month later documented the early open mobile players and the rise of open mobile web traffic in the US. Rather than “getting the operator deal”, a good enough ‘open’ browser and later app stores accelerated the pace of distribution and innovation for mobile startups and raised the tide for everyone in the ecosystem, the operators included. But the power was about to shift again. Two months later, Sam went on stage for the launch of the Loopt iPhone app in App Store at WWDC. The power was shifting towards native apps, even though at the time this trend was early and controversial. There were only 3 mobile conferences in the Valley that year, and things kicked into next gear once Google Android’s level of ambition became clearer. By 2011 it became apparent that only a fraction of apps were being discovered and the power had shifted towards the platforms behind the app stores. Startups were back to telco-style enterprise sales trying to get a “feature” of their app to get their business off the ground. There’s tons of data on the problem of app discovery. By that time there were many people innovating on it and doing smart things, including our Xyo/Priori or companies such as Chomp or Everything.me. We were all betting that there is better technology and user experiences for mobile app discovery than the top charts and limited search capabilities Apple’s App Store or Google Play offered. Very little of these technologies have been implemented. The App Store concept today largely is still a legacy model that comes out of iTunes’ music heritage (Java/WebObjects on top of a SAP system with a music data model). The Chomp team over at Apple, was quickly sidelined in its own product roadmap ambition to go beyond that. The very understaffed related engineering teams at both Apple and Google were mostly busy in scaling the app store infrastructure as the mobile user base exploded. I suppose all was good as long as the global number of mobile smartphones was growing (it’s slowly changing with iOS 11). You can see quite a bit of our perspective and thinking on app store innovation in this paper we submitted to the App Web conference in 2012. The level of innovation in app stores can be compared to the lack innovation of the Internet Explorer once they took out Netscape and it provided an opening for others to pounce. 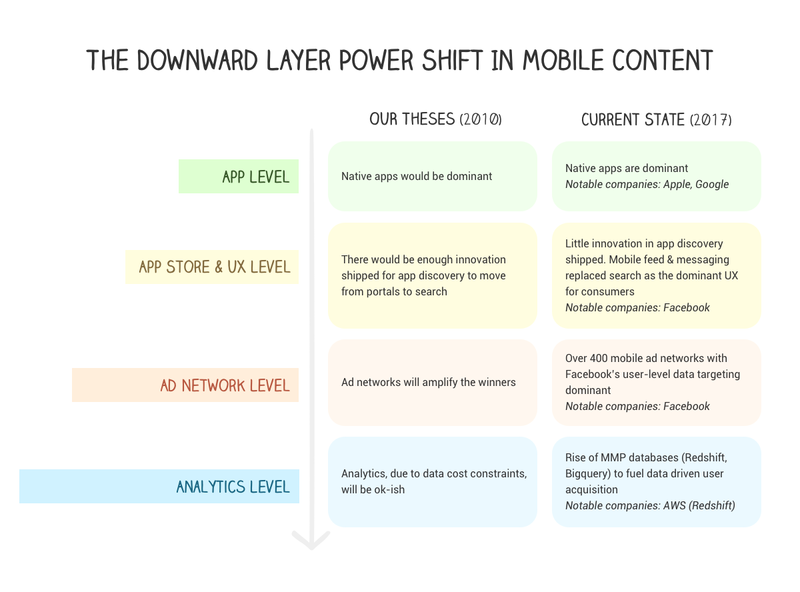 Search as the Web’s dominant discovery model didn’t translate over well into the app economies. Instead of typing, on small devices touching within a feed and underlying user-level data became the main UX model next to messaging. 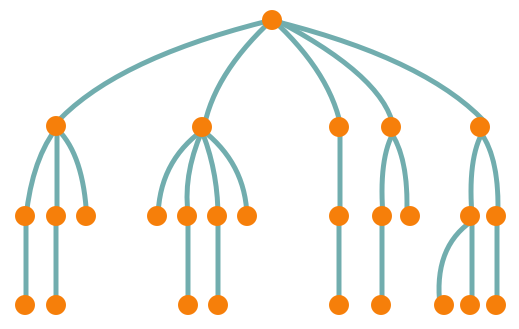 In the desktop/web-centric model the user gives an input and intent. In a search box and search engine, the intent translates spectacularly well. In mobile, the feed pushes content alternatives — based on user-level data discerning user preferences. The company that could figure out best what users might want would win at app discovery. By 2012 it became apparent that Facebook was unmatched at this. Unsolved app discovery on the app store level has also pushed power much more to the ad network level than I anticipated. There’s way more of them than I thought there would be (currently, there are hundreds of ad networks out there), and they are powerful and effective. Facebook is the mobile ad network and gives app publishers the most targeting options (FB account managers talk about 300–400 parameters total). The combination of the feed as the main UX, FB’s sheer size, and increasing targeting abilities to previously unknown levels of granularity pushed the company to the top of the mobile app discovery food chain. Very few other ad networks are equally tech-centric (e.g. Applovin) and are open to provide app publishers the instant, precise accountability for the dollars they spend. Publishers like Machine Zone can calculate their potential customer’s LTV and thus their own return on ad spend (ROAS) with sophisticated targeting, whereas old-school brand ads are still a black box. It’s a new world of advertising that creates a lot of snark. Compared to powerful mobile targeting capabilities, TV ads and almost all brand advertising appear as “nothing more than a slush fund that feeds lazy advertisers, publishers and networks, who want to avoid accountability,” as Gabe Leydon, Machine Zone CEO puts it. At the same time, ambitious app publishers have been increasingly getting more powerful because of the work of data scientists and engineers on top of a new type of databases that were very powerful and affordable: Massively Parallel Processing (MPP) databases. The reasons why this is so and what makes them really unique compared to previous technology is intensely debated, but simplicity, experimentation ease, low costs and AWS network effects are key among them (for a more nerdy debate see here). on the 3rd party analytics level earlier versions of analytics tools such as Flurry only gave them access to aggregated data (by now Flurry has been rebuilt for these changes as well). Storing and giving access to similarly powerful databases (HP Vertica, Oracle’s or SAP’s data warehouse suits) were too expensive and too complicated for most app publishers. For one they were suddenly exposed to a new generation of analytics tools that such as Amplitude that were built to a large extent on MPP databases (mostly Redshift) and that gave them access to user-level data sets and allowed them better tricks (e.g. much better behavioral analysis). Giving app publishers access to user-level is now standard, and all the leading analytics companies such as Upsight do it. Additionally, app publishers can use MPP databases themselves to easily and cheaply store user-level data there and build their own growth infrastructures that tie in user-level ad network data. And no company gives them more data than Facebook. FB and AWS are so tied to the hip on this, that similar to the PC age and Wintel (Windows & Intel) that among my entrepreneur buddies we have been calling this period of mobile content ‘Face-shift’ (Facebook and Redshift). An example of ‘Face-shift’ in action are custom Facebook Lookalikes. While Facebook provides tools for Lookalikes, many of the most advanced publishers prefer to segment their user base on their own — preferably on data warehouses of their own. An example of a powerful Facebook ad product that gives app publishers accountability — Facebook Lookalikes. The ad product allows publishers feed Facebook’s machine with a selection of top performing users of their app. Facebook creates a small/large audience of “similar” users that you can target. The power has been shifting again and again. How will the pendulum swing next? One of the interesting things to look out for is how an upcoming Google AI play will fare. Starting on October 16th, Google AdWords inventory will only be available to mobile advertisers through the UAC system, and in November, all existing Search, Display, and YouTube app install campaigns will be shut off. This is a momentous change as Eric Seufert says: Google will now effectively handle campaign management across its proprietary channels for mobile advertisers as their de facto user acquisition team, dismantling their budgets for use on individual inventory sources without any input from them and using its vast trove of data to optimize spend. In terms of approach, it’s a push in the opposite direction ‘Face-shift’ has been shifting the market. ‘Face-shift’ is a run towards individual app publishers building up data science know-how and advantages. In this new approach, Google is leveling down the marketing playing field massively. Rumour on the street is that the company is betting that it can centrally push AI techniques better than the mass of individual app developers can. Google recently started to publish impressive research papers (e.g. a new AI technique that it says can lead to substantially better predictions of click-through-rates for given adverts). Will Google come back in this game as an AI company with advertising at its core?